The Order of the Most Holy Mary Theotokos is truly an ecumenical religious order. Although our Order is in the Catholic faith tradition, each member is free to follow Christ and the teachings of the four Marian dogmas within the belief structure of the denomination of his/her own choice and according to ones own good conscience. With Christ as the foundation and center of our community, we remain dedicated to promoting devotion to the Blessed Virgin Mary, under her special Orthodox Church title, the Theotokos. We believe that the Most Holy Mary Theotokos is the Mary for all Christians. Regardless of our individual denominational backgrounds, we all share the basic Christian beliefs held about Mary, the Mother of Jesus Christ. We choose to celebrate our commonalities instead of concentrating on our differences. As we continue to promote devotion to the Blessed Virgin Mary, we do so in the hope that others might find in Mary resources for reconciliation, rather than reason for conflict. Mariology is the theological study of Mary, the mother of Jesus. Mariology methodically presents teachings about her to other parts of the faith, such as teachings about Jesus, redemption and grace. 1. Perpetual Virginity - Mary was a virgin when she conceived Jesus, and remained a virgin throughout her life. 2. Immaculate Conception - Mary herself was conceived without original sin, and remained sinless throughout her life. 3. Mother of God - Mary's son was fully divine because Mary herself was divine. This dogma includes the subsidiary dogma: Mary, Queen of the Universe. 4. Bodily Assumption - Mary was bodily taken (assumed) to heaven. There is a fifth (not yet) dogma: Mary, Co-Redemptrix - Mary shared equally with Christ in the process of redemption. This dogma exists fully within the other four, and lacks only the official title. Regarless of our individual views on these dogmas, we are in agreement that Mary can be understood only in concert with Jesus Christ, the Trinity, and the Church. We appreciate that the most important features of Mary's role and person are captured in the four Marian dogmas, and that these dogmas have a rich meaning for our spiritual life. To better respond to questions often asked about how we reconcile our diversity of denominations and our equally diverse Marian views, especially with regard to the doctrine of the Immaculate Conception, we must first briefly examine the doctrine, and then take a look at how various Christian faith traditions view this doctrine. In Roman Catholicism, the dogma that Mary was not tainted by original sin. Early exponents included St. Justin Martyr and St. Irenaeus; St. Bonaventure and St. Thomas Aquinas were among those who opposed it. In 1439 the Council of Basel stated that the belief was in accordance with Catholic faith, and in 1709 Pope Clement XI made the feast of the Immaculate Conception a holy day of obligation. In 1854 Pius IX issued a papal bull making it official church dogma. For differing reasons the doctrine in its particular Catholic form is generally not shared by either Eastern Orthodox Churches, the Anglican Communion, or by the various Protestant communities. Orthodox Christians believe that Mary was without sin for her entire life, but they generally do not share the Augustinian and Medieval Roman Catholic Church's views on original sin. They note that St. Augustine (d. 430), whose works were not well known in Eastern Christianity until after the 17th century, has exerted considerable influence over the theology of sin that has generally taken root in the Latin Rite. However, Augustine's theory that Original Sin is propagated by the concupiscence of reproduction and that it can be expressed in terms of stain and quasi-personal guilt is not shared by Eastern Orthodoxy. However, nor are these the terms that dogmatic pronouncements of the Roman Catholic Church use to define original sin, and an examination of Roman Catholic dogma - as opposed to theological opinion - actually shows significant agreement, as original sin is defined as a privation of the original justice and sanctifying grace which was enjoyed in Eden. Some Eastern Orthodox theologians suggest that the references among the Greek and Syrian Fathers to Mary's purity and sinlessness may refer not to an a priori state, but to her conduct after she was born. However, Eastern Christianity tends to focus on the fact that the main consequence of sin is the distortion of the nature of this world (prominently including, but not limited to, the nature of the human race). He cleansed Eve's body and sanctified it and made for it a dwelling in her for Adam’s salvation. She [i.e., Mary] was born without blemish, for He made her pure, without pollution, and she redeemed his debt without carnal union and embrace...Through the transgression of Eve we died and were buried, and by the purity of Mary we receive honour, and are exalted to the heights. Belief in the Immaculate Conception is not a doctrine within Anglicanism although it is believed in by some Anglo-Catholics. In the Book of Common Prayer, December 8 is observed as the "Conception of the Blessed Virgin Mary" as a "lesser commemoration" and its observance is optional. Members of the Society of Mary, however, are expected to attend Mass on this day. The report "Mary: Faith and Hope in Christ" by the Anglican-Roman Catholic International Commission, concluded that that the teaching about Mary in the two definitions of the Assumption and the Immaculate Conception can be said to be consonant with the teaching of the Scriptures and the ancient common traditions. But the report expressed concerns that the Roman Catholic dogmatic definitions of these concepts implies them to be "revealed by God" and stated that: "The question arises for Anglicans, however, as to whether these doctrines concerning Mary are revealed by God in a way which must be held by believers as a matter of faith." Old Catholics do not reject the Immaculate Conception of Mary, but Rome's dogma regarding it, because Old Catholics reject Papal infallibility and do not believe the Pope can, by himself, define a dogma. Some Old Catholic parishes venerate Mary as the Immaculate Conception and celebrate the Feast of the Immaculate Conception. Old Catholics hold that the faithful whose conscience does not bind them to belief in the Immaculate Conception, who do not believe it in good conscience, cannot be required to believe it because it has not been infallibly defined as dogma by the Church, the Pope having no authority to act in the capacity of the Church. Although the Lutheran Church teaches that Mary was immaculately conceived, most Protestants reject the doctrine because they do not consider the development of dogmatic theology to be authoritative apart from biblical exegesis, and that Mariology in general, including the doctrine of the Immaculate Conception, is not taught in the Bible. Protestants argue that God would also need to have intervened in the conception of Mary's mother, and her mother, and so on down the ages. Roman Catholicism's response to this is that Mary did not need to be kept free from sin for Jesus to be sinless, rather her immaculate conception was a special privilege granted her by God. The primary argument is that the Bible portrays Jesus as the only person without sin. The apostle Paul, in the Epistle to the Romans 3:23, teaches that "all have sinned and fall short of the glory of God". Peter, in 1 Peter 2:22, states that "He [Jesus] committed no sin". A further argument put forward by Protestants is from Gospel of Mark 10:18 and the parallel Gospel of Luke 18:9. When Jesus is addressed as "Good teacher" (Mk 10:17), He is quoted as replying "No one is good—except God alone". It is posited that in doing so Christ clearly teaches that no one is without sin, whilst leaving room for the conclusion that he is in fact God incarnate. However, Catholics respond that this phrase is meant in the sense that a man may only be good by participation of God's goodness. Some Protestants also teach that sinful nature is inherited from the father. Since Jesus of Nazareth did not have an earthly father, he did not inherit a sinful nature; hence, Mary did not need to be immaculately conceived. These Protestants base this view on Romans 5:12 which states that sin entered the world through a man, Adam (even though this word in the Bible means, merely, "human being") and 1 Corinthians 11:3 which says that the head of every woman is the man. In response, however, Catholics hold that the sin of Adam and Eve stains a person's soul, and both parents only contribute to the body of a newborn child - not the child's eternal soul - meaning that God allows original sin to make contact with, and therefore contaminate the individual spirit - and, by the same token, God can certainly preserve someone from original sin as well. Also, as Adam was created before Eve, and as Eve came from Adam, his sin would cause more effect. Protestants also point to the words of Mary herself stating that she needed a savior. In her song while visiting Elizabeth (in Luke 1:46-47) she says: "My soul glorifies the Lord and my spirit rejoices in God my Savior". If Mary was indeed without sin, she would not need a "savior", therefore by her own words she declares that she is a sinner in need of a savior. Catholics respond to this saying God saved Mary from sin at the moment of her conception instead of after, therefore God still would be Mary's savior, just in a different way. The love and reverence given by all Christians, until the Reformation, to our Lord’s Mother have been of the highest spiritual and moral value. They have inspired the ideal of chivalry towards all women. They have supported the teaching of St. Paul that in Christ men and women are equal. They have strengthened, as perhaps nothing else could have done, personal purity and the ideal of the Christian home. They are one of the most precious parts of Christian tradition, and the sects which have cast them away have suffered immeasurable loss. Mary is called Theotokos, meaning “God-bearer” or “the Mother of God,” because she bore the Son of God in her womb and from her He took His humanity. Elizabeth, the mother of John the Baptist, recognized this reality when she called Mary, “the Mother of my Lord” (Luke 1:43). Mary said of herself, “All generations shall call me blessed” (Luke 1:48). So we, Catholic, in our generation, call her blessed. 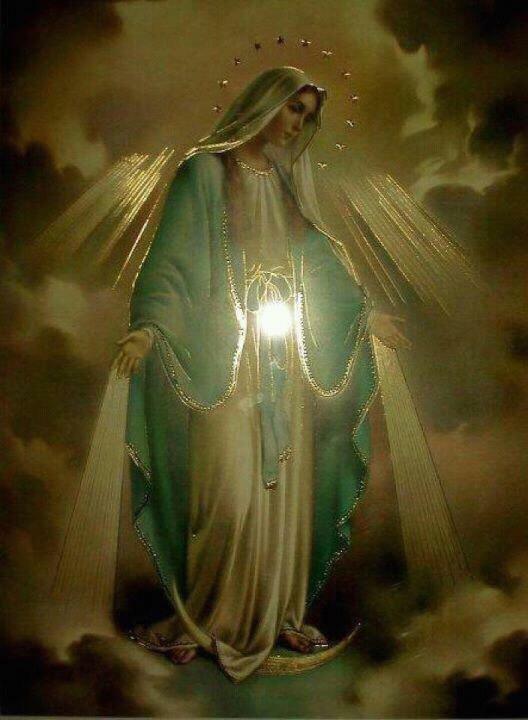 Mary lived a chaste and holy life, and we honor her highly as the model of holiness, the first of the redeemed, the Mother of the new humanity in her Son. The Order of the Most Holy Mary Theotokos was founded as a religious order with a particular devotion to the Blessed Virgin Mary. We make no apologies for the role of Mary that we recognize and incorporate in our beliefs. As a Catholic ecumenical religious order, we believe and teach what is in the Sacred Scriptures and what has been declared by the first seven Ecumenical Councils of the undivided Church. We are aware of the extremes of Marian piety that have developed over the centuries, and while we may believe any of these teachings, we may not impose them or teach them as defined doctrine in our Order. That is really an important distinction for us as an ecumenical religious order. There are many devotions which center on Mary. All insights are useful for a fuller understanding of her role in God’s plan for our salvation, but like many other issues, we distinguish for ourselves what are essential beliefs and what are theological thoughts on a topic. These devotions can help us draw closer to Almighty God and thus they are good and useful. However, being ecumenical, we respect the beliefs of each individual member of the community and do not attempt to impose our personal piety on one another. Our faith and our Order are theologically big enough to embrace all those positions. Particularly, we are aware that the doctrines of the Immaculate Conception of Mary (defined in 1854) and the Assumption of Mary (defined in 1954) are beliefs that have some theological basis in Sacred Scripture and Catholic Tradition; however, they were not defined as Catholic Faith doctrine by the undivided Catholic Faith, therefore we do not impose these doctrines as matters of faith. We celebrate not only our diversity of denominational affiliations within our community, but also our diversity of Marian views. ...the love of Christ must come before all else.